It’s time for another giveaway! This time around I’m giving away 5 pairs of tickets to a special screening of Red Dawn on March 11th in London. 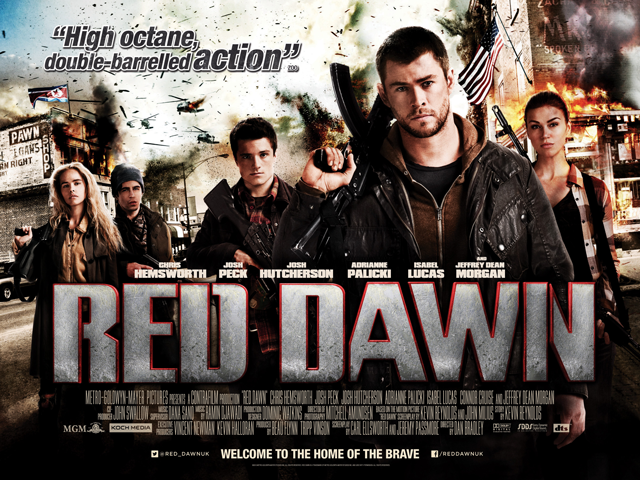 I love the look of Red Dawn; I think it’s going to be so cheesy, but a lot of fun. It’s a remake of the 1984 movie of the same name, which starred Patrick Swayze and Charlie Sheen, and this time they’ve got quite an awesome cast as well. It stars Chris Hemsworth (Thor, Avengers Assemble) Josh Hutcherson (The Hunger Games), Josh Peck (The Wackness), Adrianne Palicki (G.I. Joe: Retaliation, Friday Night Lights), Connor Cruise (Seven), Isabel Lucas (Transformers: Revenge of the Fallen) and Jeffrey Dean Morgan (Watchmen, Grey’s Anatomy). You’ll also get an extra entry if you mention the giveaway on Twitter with the hashtag #missgeeky, and another extra entry if you follow @Red_DawnUK. The competition is open to everyone, but you’ll be expected to make it to a Central London on March 11th at at 18:30. The winners will be drawn randomly and I will contact them on Friday March 7th.